The design was inspired by Anglo-Saxon and Norman country churches. Its notable feature was the squat, square, crenellated tower with a steep spire set on a considerably larger base. The variety and placement of windows suggested the effect of an ancient building that had been remodeled through the centuries. The prominent chimney, with its crenellations matching those of the tower, was an anachronism, as English country churches were not heated, unlike their late nineteenth-century American counterparts where such amenities were a necessity. 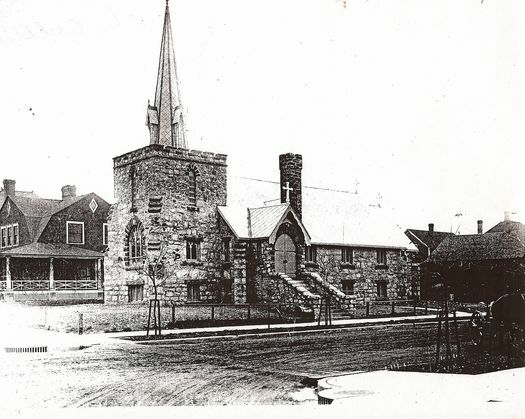 Christ Episcopal Church was probably Gilbert's most ill-fated building. Completed in 1896, it was disassembled in 1919 when Hibbing's open pit iron mine was expanded. 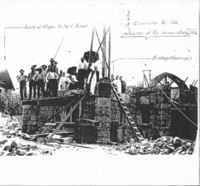 [The church was first disassembled in 1919 (Christen-2001 p 38) or in 1912, according to a handwritten note on a photograph from St James Episcopal Church records, "Ceremony for the re-laying of the cornerstone Oct 17, 1912."] It was then reassembled on a new site about a mile to the south. The new design was faithful to the original except that the building was raised above the ground to provide a usable basement. In addition, the entry porch, originally constructed of wood, was rebuilt in stone to match the rest of the building. 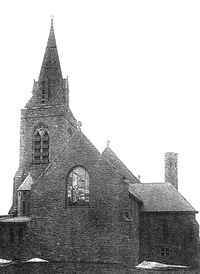 In 1945, the mine was again expanded and the church was again demolished. It was not rebuilt.